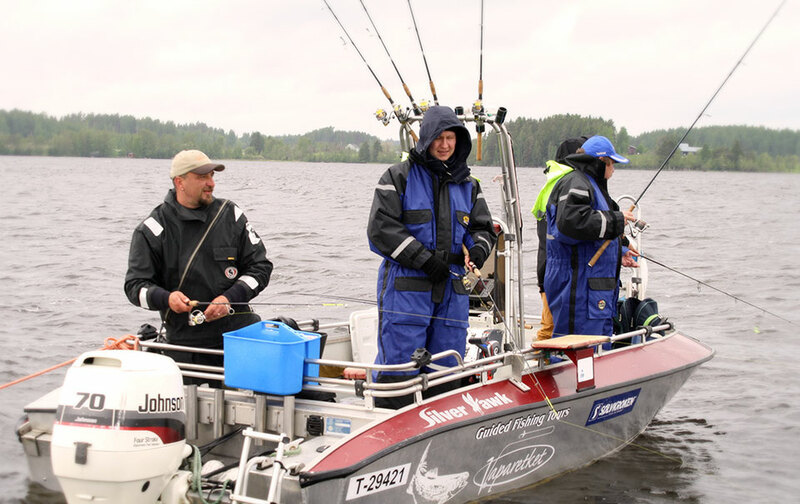 Tuulenhauki Ltd organizes fishing trips. You can choose a full-service package, fishing with a professional fishing guide, all equipment and floating suites included. All You need is to step on board and enjoy your fishing day! Or You can choose rent-a-boat and fishing on your own, and buy a ”start-up” guidance. This package includes guidance in local fishing destinations and game species, on-the-spot. If You choose to stay overnight in Villa Wohde, we have 12 angling rods for free use, and baits as well. There are excellent places for angling nearby. We provide an outdoor place for cleaning fish and grill or smoke fish. We also have vacuum device to pack fish, and a freezer. For further information and prices, please contact us tel +358-440-232324 or email wohde@tuulenhauki.fi. The most common fish species at the area are perch, zander and pike. In fresh water there are even pikes over 10 kg – real beasts! In Spring and Autumn You can fish whitefish with small flies. Seatrout appears too. Baltic Herring moves at the area in huge blocks during early summer and in Autumn. In winter one can fish burbot with nets or hooks under ice. In fresh water basin there lives vendace as well, which is a nice small whitefish, but can be caught only with nets. Both at sea and lake there are lots of breams and roaches, ides and rudds appear as well.